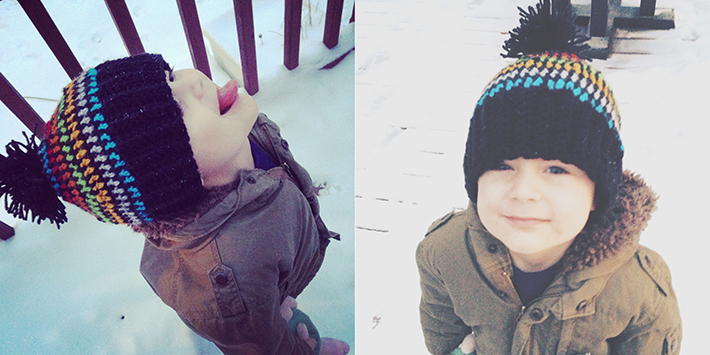 It has been brutally cold here in Chicago for the past few days. We’ve been snowed in and hit with record low temperatures. 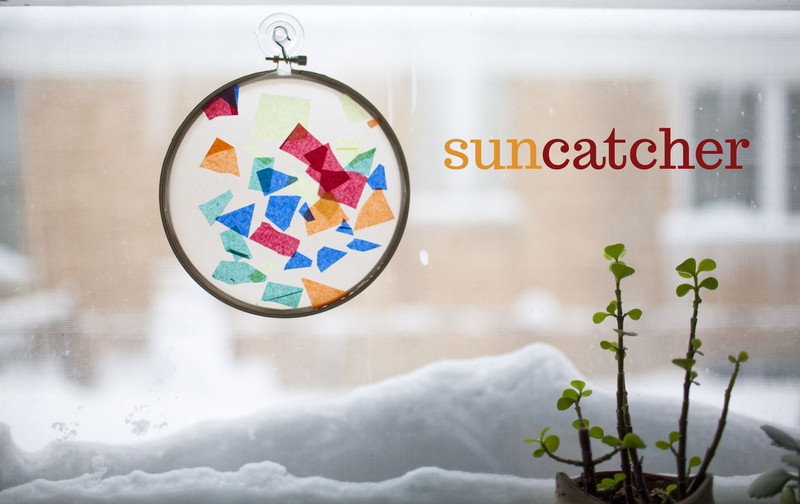 I thought making this little sun catcher would help bring some color to this dreary winter. It was pretty fun to make for milo, since he got to use his very own scissors and do essentially most of the work. I love the little burst of color it brings to my cold, snowy window. Measure two sheets of contact paper to be about 1 1/2 inches bigger than your embroidery hoop. 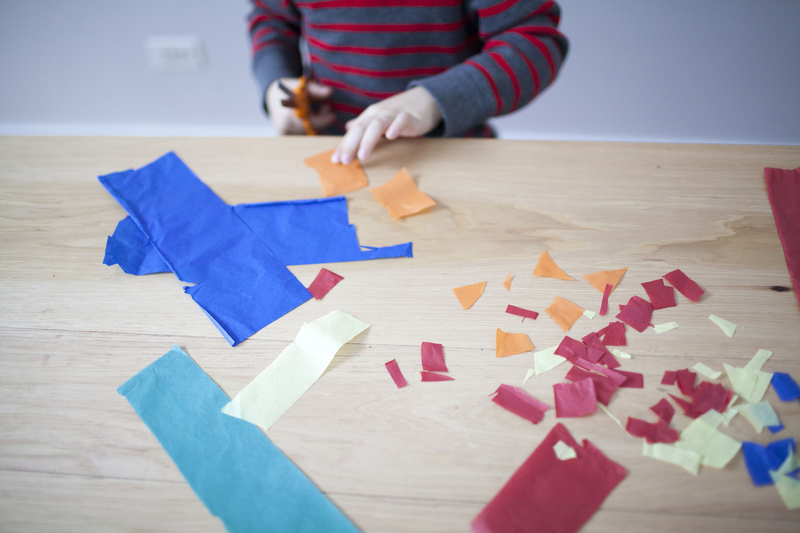 Cut out various shapes of the tissue paper. Peel away one of the sheets of contact paper and apply the shapes to the sticky side. When finished, peel away the other piece of contact paper and place sticky sides together to protect the tissue paper pieces. Place within the embroidery hoop and use a suction cup hook to hang in the window. This is kind of like making your own cereal! Its similar to oatmeal, but its not warmed up. I really enjoyed it, and it was a nice departure from my normal breakfast routine. I can think of numerous ways to customize this and make all kinds of versions of it. You can serve it with almond milk, or on top of yogurt. I ate mine with some almond milk and chopped dried figs and apples. Yum! 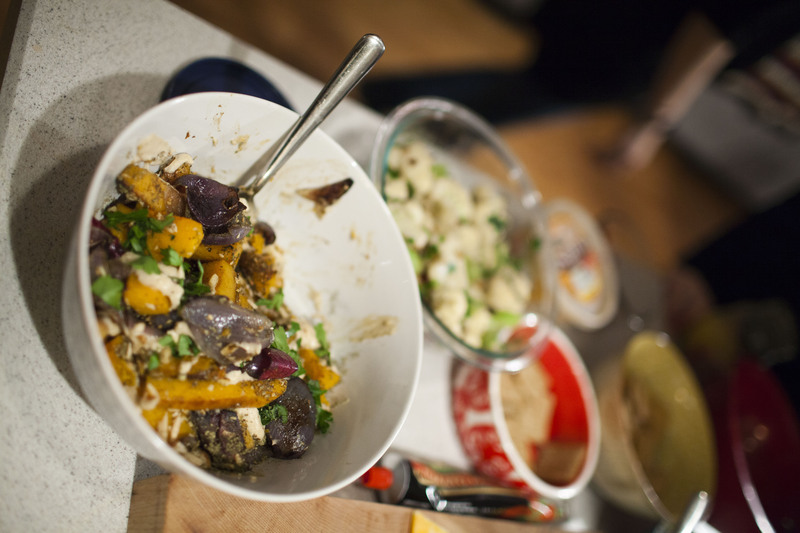 Mix the top ingredients together in a bowl and toss around until evenly coated. Bake on a rimmed cookie sheet for 18-20 minutes until golden brown. Stir and rotate one time, half way through baking. 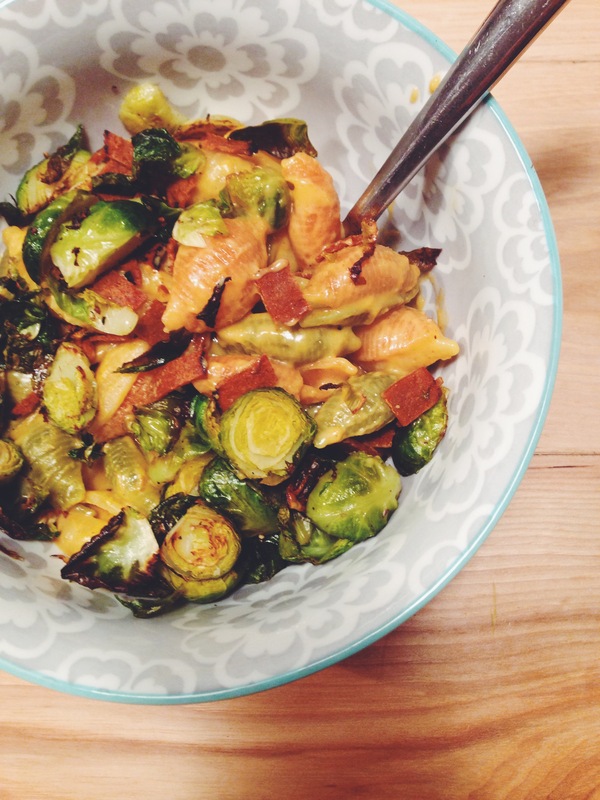 When cool, add the toasted coconut chips. Store in airtight container. 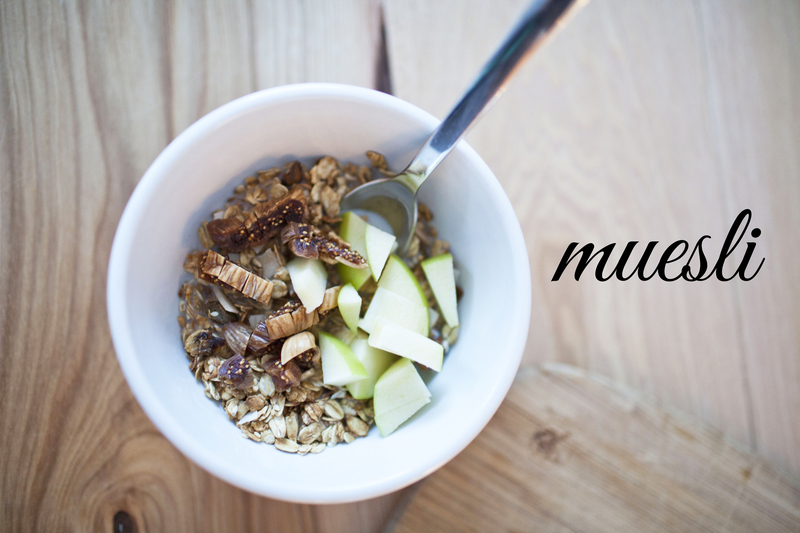 serve with almond milk or yogurt, and top with diced apples and dried figs. I love made by rae patterns. They are always so cute, and the patterns are well priced and very easy to understand. I made the washi dress this summer, and I still can’t believe I made a dress – THAT I CAN WEAR! I love this bag! The pattern is only $8. It was pretty easy to make – and only has three pattern pieces, so the prep time is even pretty fast. 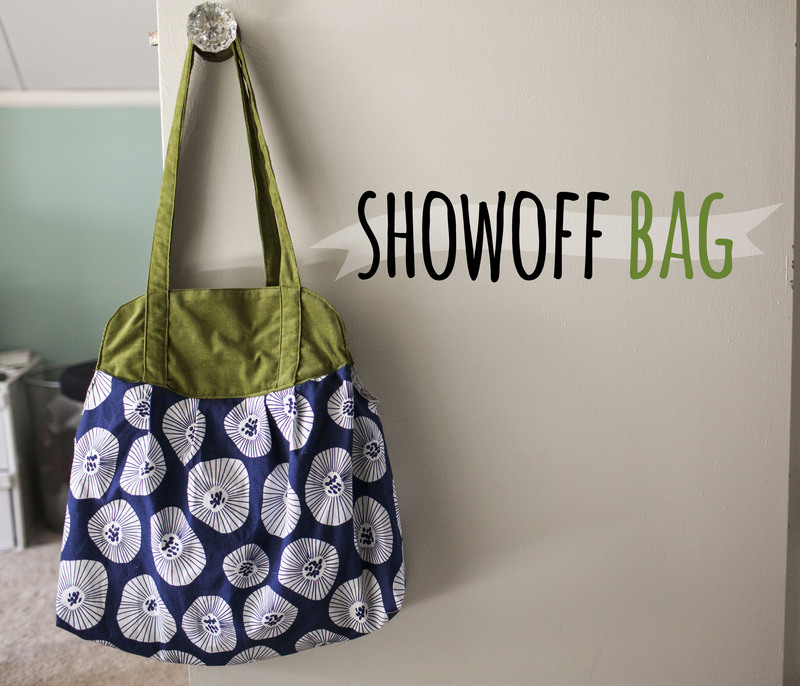 I love how this bag came out, and I definitely want to make more! The possibilities seem endless! I see a few more of these in my future for sure! 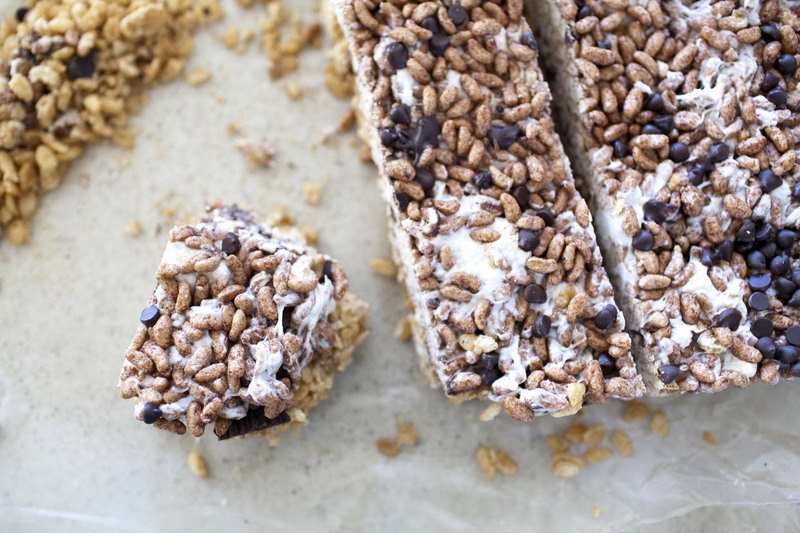 double decker chocolate chip peanut butter rice krispie treats. I made these for our christmas eve lunch, so I knew I had to step up my rice krispie treat game. These are peanut butter rice krispies at the bottom, a layer of cut – up justin’s peanut butter cups, then a layer of cocoa-krispie treats topped with mini chocolate chips. All held together by dandies. hubba hubba. Line a 11×7 (or use a 9×13 pan and just dont fill all the way b/c who has a 11×7 pan??) baking pan with aluminum foil/parchment paper. Generously spray with nonstick spray. Set aside. To make the peanut butter layer, melt the earth balance and peanut butter in a large saucepan over low to medium heat. Add the marshmallows and constantly stir until they are completely melted. Mixture will be thick. Remove from heat and add in Rice Krispie cereal. Mix together well. Press mixture into prepared baking pan. I used a spatula sprayed with nonstick spray to make the sticky mixture easier to press down. Top peanut butter layer with chopped up peanut butter cups. Set baking pan aside. To make the chocolate layer, melt the earth balance in the same large saucepan over low to medium heat. Add the marshmallows and constantly stir until they are completely melted. Remove from heat and add in Cocoa Krispies cereal. Mix together well. Press mixture on top of the peanut butter layer. Press chocolate chips on top of chocolate layer and allow to set for at least 30 minutes. Cut into squares. 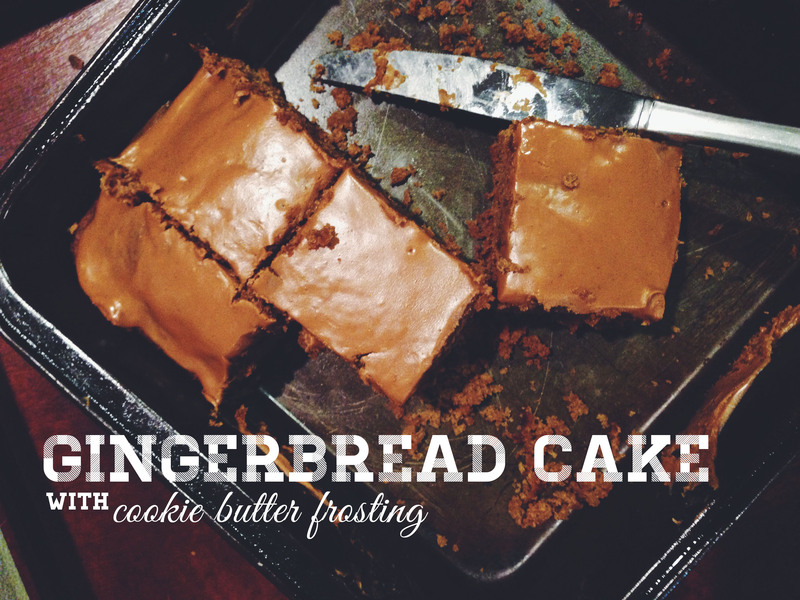 gingerbread cake with cookie butter frosting. I have been wanting to make this cake since I saw it posted here. I thought it would be perfect for the holidays, but the timing didn’t work out. I ended up making it for book club and it got devoured. Its a perfect little snack cake – not too sweet – and topped with melted cookie butter. (aka biscoff spread, trader joes speculoos cookie butter). Preheat oven to 350 degrees. Grease an 8×8-inch square baking pan. Set aside. In a large bowl, whisk together flour, ginger, cinnamon, nutmeg, cardamom, baking powder, and salt. In a medium bowl, whisk together melted earth balance, sugar, egg replacer, and molasses. Whisk until smooth and well combined. Add the hot water and vanilla and stir to incorporate. Add the wet ingredients all at once to the dry ingredients. Stir to combine. Pour into the prepared pan. Bake for 30 to 35 minutes, or until toothpick inserted in the center of the cake comes out clean. Allow to cool in the pan for 2o minutes before frosting. When cake has cooled, but is still just warm to the touch, gently spread with cookie butter. Be gentle, as to not tear the cake. The cookie butter will begin to melt against the warm cake as it is spread. Place cake in the fridge to set the cookie butter for about 30 minutes before serving. 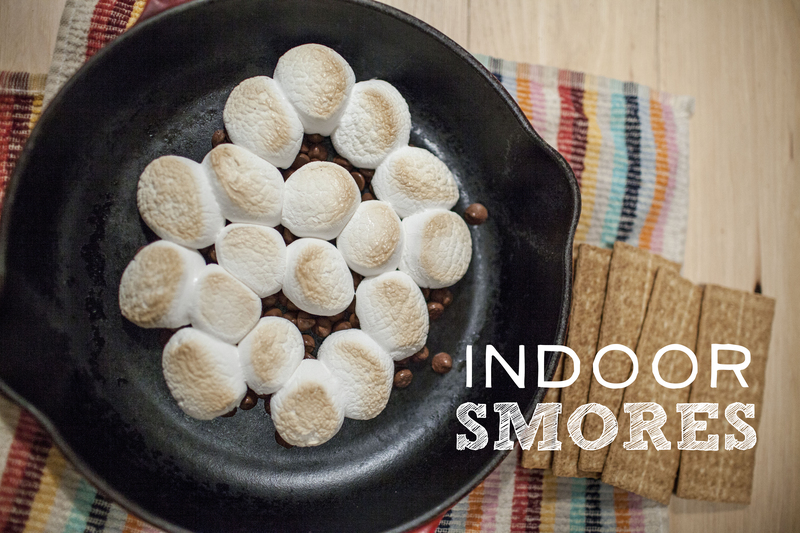 You want smores this winter but don’t have a campfire to make it happen? Fear no more! I have come to save the day! In a cast iron skillet, add some chocolate chips. (about a cup or so). Cut your marshmallows (i used dandies) in half and top the chocolate chips with them. Bake for 7-9 minutes, or until the marshmallows turn golden brown. Stella got her first hoodie a few weeks ago and she really liked it. Shes smaller than we thought she would be, and pitties seem to love to be warm, so I got her one and she seems to really enjoy it. 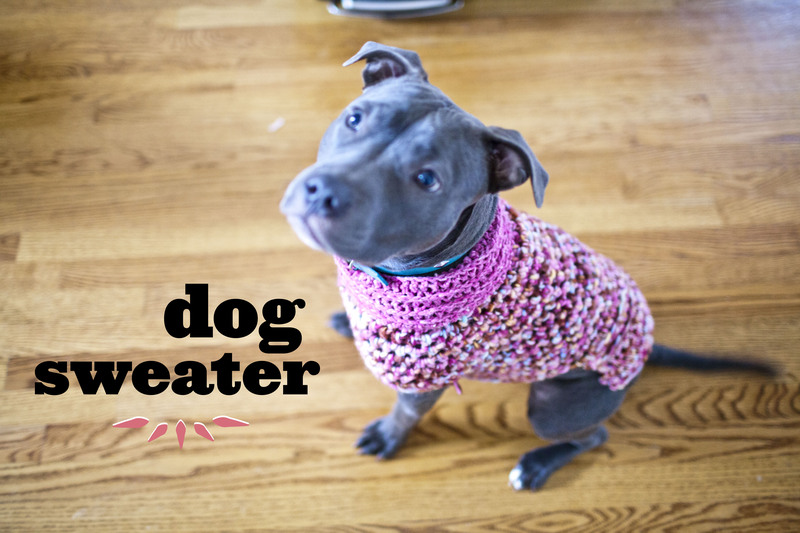 She hasn’t been too much of a fan of all this snow and cold weather we have been getting – so to help get her through this winter, I thought I would take a stab at making her a sweater with some yarn I had laying around (which is why its so pink!) It definitely needs some work, but this was a pretty easy pattern to follow. I may take another stab at it, but she seems to like it, and it keeps her warm in these chilly temperatures. I’m thinking of trying to take a stab at another one this weekend….We’ll see how that goes. 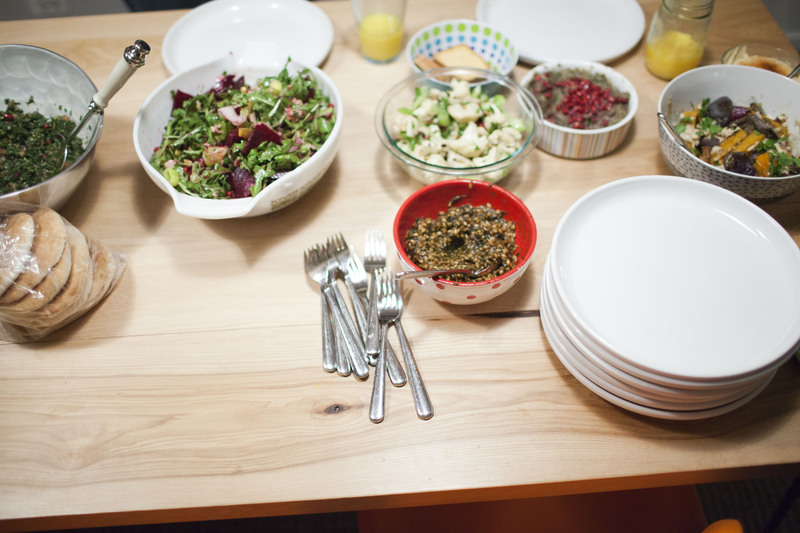 jerusalem potluck and a hummus recipe. 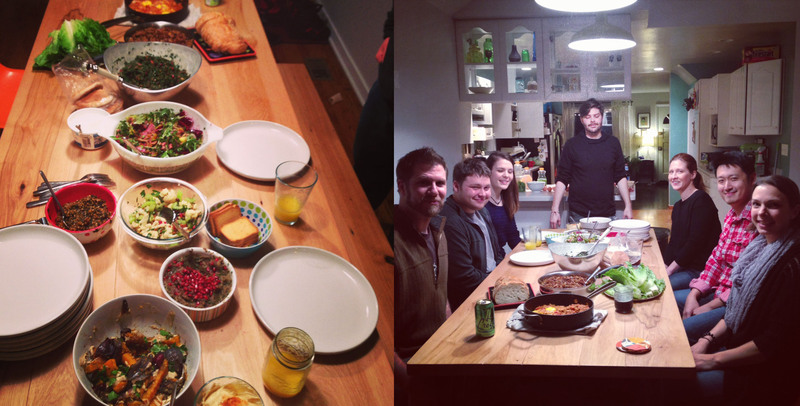 Shortly after the holidays, I had a small potluck where I asked everyone to cook from the Jerasulem cookbook. Last year, around this time, my husband visited Jerusalem with his mom, and shortly afterwards she gifted me with this cookbook. All I have been hearing about for the last year is how amazing the food was when they were there. If it tasted anything like the food in this cookbook looked, then I don’t doubt it! 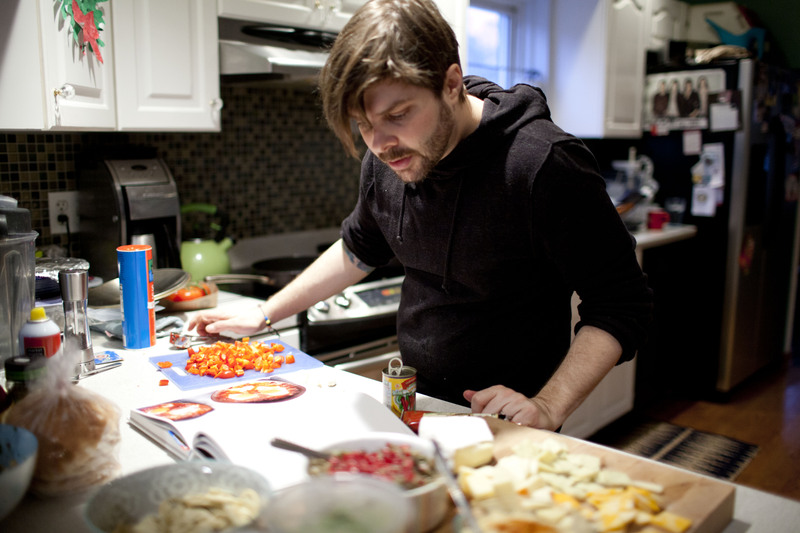 I made one salad earlier in the year from this book and it was out of this world good. I picked up fresh baked pita bread, baklava and halva from our local middle eastern grocer, and we had a great dinner. 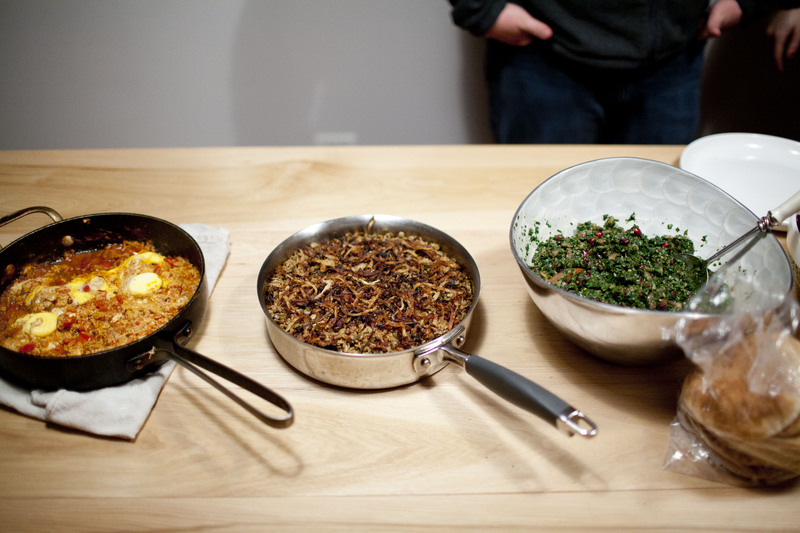 Everything was really really delicious, but I think my favorite was suprisingly the tabouleh. 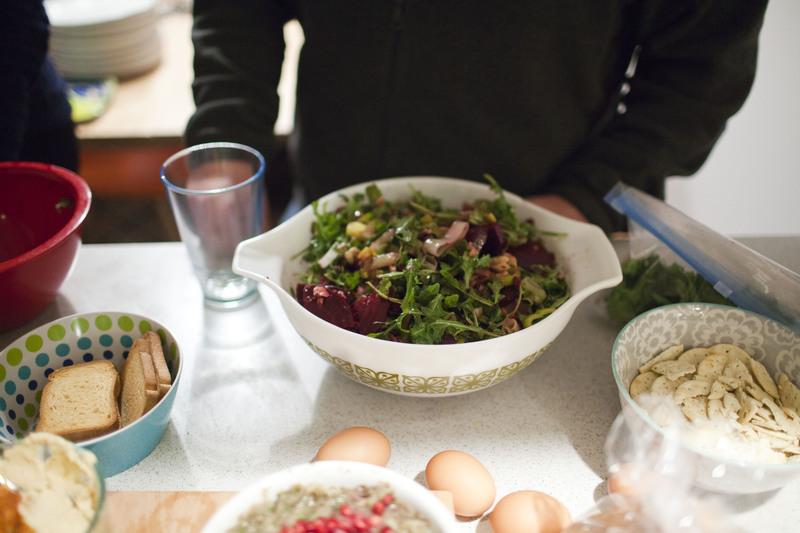 It was definitely different than the tabouleh I’m generally used to – this one had pomegranate seeds in it! I definitely recommend this cookbook! 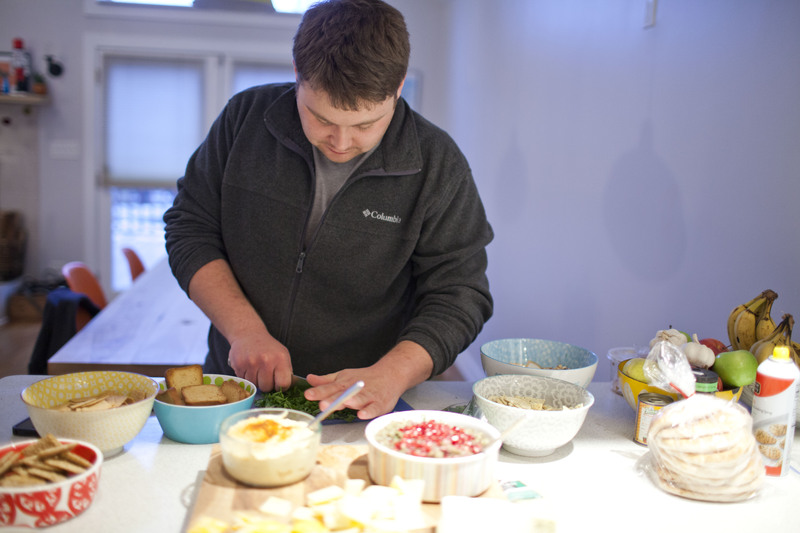 Mix all the ingredients together in a food processor or vitamix blender. Top with a few dashes of the paprika and a little more olive oil if you wish. 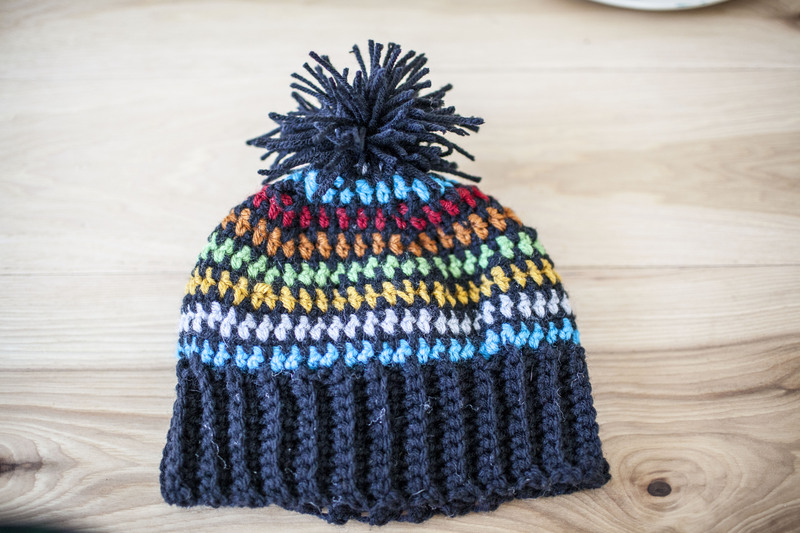 This is a pretty easy hat to make for a kiddo – using scrap yarn. 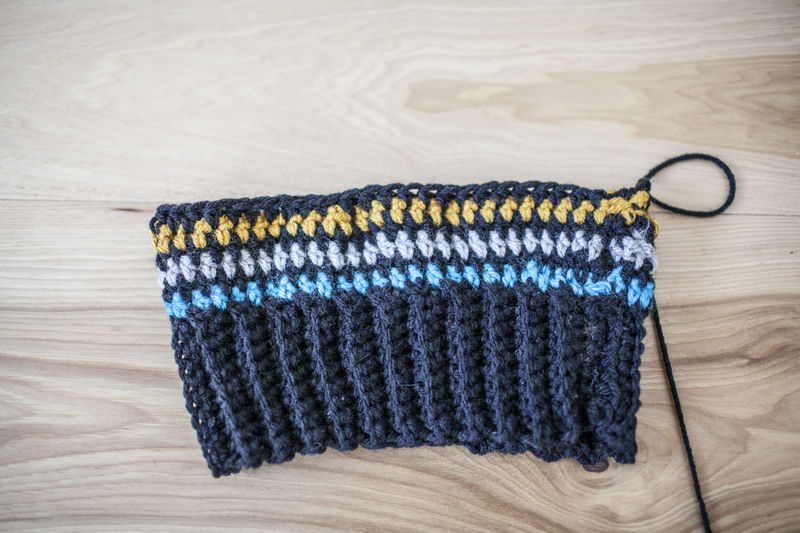 You can use any combination of colors – I used a 6mm hook and red heart yarn. I followed this pattern, only my hat came out more rounded, than triangular. ( I think i missed the chain twos at the end when i was going around…ooops! ), but in the end I came up with something that still works, and used up some of scrap yarn while at it! 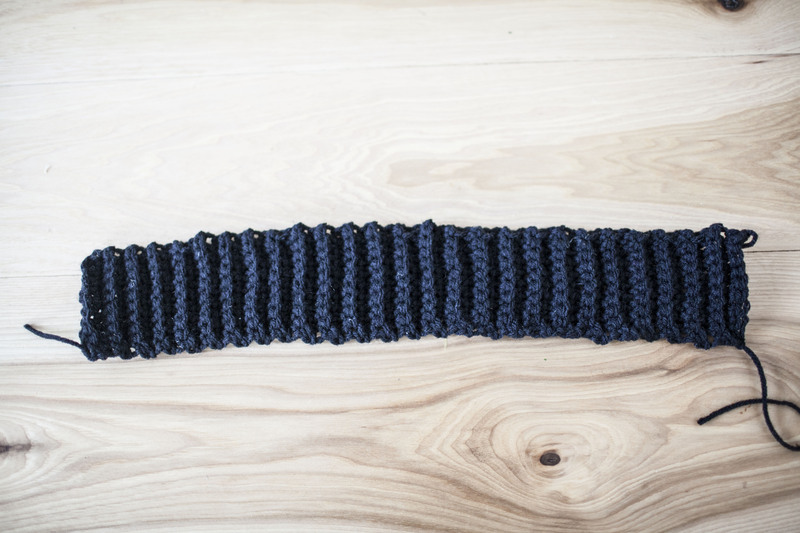 I started with making the band first, using a ribbing stitch until it was 18 inches long. Then I crocheted half double crochets all around, switching colors after each row, until it was time to decrease. I decreased my stitches, as the pattern told me to until I got to the point that my hat was too tight to flip in and out and I made a big pom pom to put at the top.